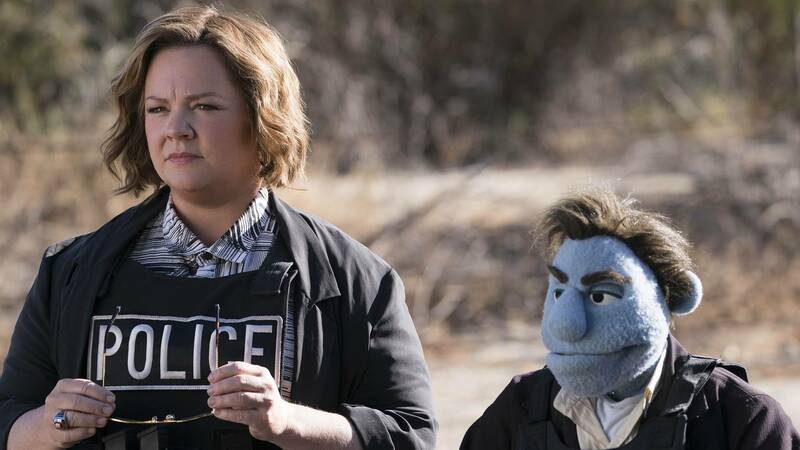 Melissa McCarthy stars in "The Happytime Murders." New in Amarillo theaters: Puppet murders, robotic dogs and a Hamilton star's electric film debut. Plus, some genuine classics get special screenings. The RiffTrax crew will take on the notoriously awful sci-fi film in a live screening at 7 p.m. Aug. 23, followed by an encore at 12:55 p.m. Aug. 25, at both Amarillo Star 14 and Hollywood 16. The sci-fi classic will screen (for at least a week) beginning Aug. 23 in a 50th anniversary celebration at Amarillo Star 14. The Center for the Study of the American West will conclude its two-day screening event focused on iconic Western films with John Huston's The Unforgiven on Aug. 23. It will screen at 7 p.m. Aug. 23 in the Amarillo College Concert Hall Theatre on the Washington Street campus. Admission is free. Call 806-651-5238. The TCM Big Screen Classics series continues with a 60th anniversary presentation of the Rogers & Hammerstein musical South Pacific at 2 and 7 p.m. Aug. 26 and 29 at both Amarillo Star 14 and Hollywood 16. A 25th anniversary screening of inspirational football drama Rudy will screen at 2 and 7 p.m. Aug. 28 at both Amarillo Star 14 and Hollywood 16. Sept. 6: Advance tickets are on sale for horror film The Nun and action thriller Peppermint at Hollywood 16; Amarillo Star 14 should follow. Sept. 7: Inspirational family drama God Bless the Broken Road is scheduled to open nationally, but advance tickets are not yet on sale. Additionally, the indie drama Puzzle, about a harried mother finding renewal in putting together jigsaw puzzles, is scheduled to open at Westgate Mall 6. Sept. 9 and 12: The TCM Big Screen Classics series continues with a presentation of the Rogers & Hammerstein musical The Sound of Music at 2 and 7 p.m. Sept. 9 and 12 at both Amarillo Star 14 and Hollywood 16. Sept. 13: Advance tickets are on sale now for action-adventure remake The Predator at Amarillo Star 14 and Hollywood 16. Sept. 13: Advance tickets are on sale now for thriller A Simple Favor and inspirational drama Unbroken: Path to Redemption at Hollywood 16. Amarillo Star 14 should follow. Sept. 13: Advance tickets are on sale now for trippy, bloody horror film Mandy at Amarillo Star 14. It's unclear if it's an extended run or a one-night-only screening. Sept. 13 and 15: Biblical stage drama Moses will feature massive sets, special effects and live animals in a production filmed before a live audience. It'll screen at 6:30 p.m. Sept. 13 and 12:55 p.m. Sept. 15 at Amarillo Star 14. Sept. 14: Crime drama White Boy Rick is scheduled to open nationally, but advance tickets are not yet on sale. Sept. 15: The highly anticipated rematch between boxers Canelo Alvarez and Gennady Golovkin will stream live at 7 p.m. Sept. 15 at Amarillo Star 14. Sept. 15 and 17: Anime feature Dragon Ball Z: Broly — The Legendary Super Saiyan will screen (English-dubbed) at 12:55 p.m. Sept. 15 and 7 p.m. Sept. 17 at both Amarillo Star 14 and Hollywood 16. Sept. 16 to 19: Dinosaurs come roaring back to theaters with 25th anniversary screenings of the original Jurassic Park at 2 and 7 p.m. Sept. 16 and 7 p.m. Sept. 18 and 19 at Hollywood 16. Sept. 20: Anime feature Digimon Adventure tri: Future will screen (English-dubbed) at 7:30 p.m. Sept. 20 at both Amarillo Star 14 and Hollywood 16. Sept. 21: Incendiary political documentary Fahrenheit 11/9, children's fantasy film The House with a Clock in Its Walls and drama Life Itself are scheduled to open nationally, but advance tickets are not yet on sale. Sept. 23 and 26: The TCM Big Screen Classics series continues with a presentation of the seminal teen angst drama Rebel Without a Cause at 2 and 7 p.m. Sept. 23 and 26 at both Amarillo Star 14 and Hollywood 16. Sept. 27: Sir Ian McKellen stars in a West End production of Shakespeare's classic drama King Lear, filmed live and streamed one night only at 7 p.m. Sept. 27 at Amarillo Star 14. Sept. 27: The 1986 animated feature Transformers: The Movie returns to the big screen for one night at 7 p.m Sept. 27 at both Amarillo Star 14 and Hollywood 16. Sept. 28: Horror film Hell Fest, a modern-day retelling of Little Women, comedy Night School and animated feature Smallfoot are scheduled to open nationally, but advance tickets are not yet on sale. Additionally, the Glenn Close drama The Wife, about a writer's spouse who questions her life choices when her husband wins the Nobel Prize, is scheduled to open at Westgate Mall 6. Alpha (AS-14, H-16); Ant-Man and the Wasp (H-16); Avengers: Infinity War (WM-6); A.X.L. (AS-14, H-16); Beautifully Broken (AS-14); BlacKkKlansman (H-16); Blindspotting (WM-6); Christopher Robin (AS-14; H-16; Sandell Drive-In, 12 S. Center Drive in Clarendon; and Tascosa Drive-In, 1999 Dumas Drive); Crazy Rich Asians (AS-14, H-16); The Darkest Minds (WM-6); Deadpool 2 (WM-6); The Equalizer 2 (AS-14, H-16); The Happytime Murders (AS-14, H-16); Hotel Transylvania 3: Summer Vacation (AS-14, H-16); The Incredibles 2 (H-16); Jurassic World: Fallen Kingdom (AS-14); Mamma Mia! Here We Go Again (AS-14); The Meg (AS-14, H-16); Mile 22 (AS-14, H-16); Mission: Impossible — Fallout (AS-14, H-16); Ocean's 8 (WM-6); Operation Finale (AS-14 and H-16 beginning Tuesday); Slender Man (AS-14, H-16); Solo: A Star Wars Story (WM-6); The Spy Who Dumped Me (H-16 and Tascosa); Tag (WM-6); and Upgrade (WM-6).